This was the original Meade Room. It was changed in 1993 to the Grant Room and then again to the Sheridan Room in 2007. 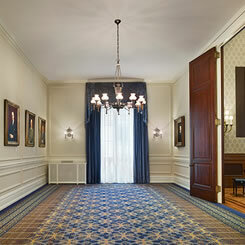 The Sheridan Room features newly matted, framed and glazed 19th century colored lithographs of Civil War scenes. An oil portrait of Grant by Samuel Bell Waugh hangs in the northeast corner. In addition there is an equestrian sculpture of Grant done by Joseph Alexis Bailly. © 2019 The Union League of Philadelphia.